Street styles usually show us what’s available in stores now. Those who are invited to the fashion shows often attend many events all over town. Their clothes and shoes have to be practical for walking, and for the weather. Influencers, editors, and merchandisers come in various sizes, shapes, and colors. As much as the modeling world has made strides in diversity, models are still much taller and thinner than most of us. The 70s are back, so this fall you’d need some corduroy in your closet. Start with flared corduroy pants, jackets, and mini skirts. If you don’t already have them you’ll want a few pieces in warm colors (think browns, oranges, and warm reds). Add a turtle-neck sweater and knee-high boots for a complete throwback to the 70s. Corduroy handbags are a fun alternative to traditional suede and leather bags. Frances Valentine (the company started by the late Kate Spade) has a number of shapes and sizes, and my favorite is their small bucket-bag. For an under $50 corduroy piece, Zara has a cross-body circular corduroy bag. Corduroy shoes come in a variety of styles from slip-on sneakers to designer clogs. If you want something subtle, try corduroy accessories like this hair scrunchie from Free People. The leopard print is a fall fashion staple, and this year is no different. If you’re buying something new, look out for zebra prints and colored snakeskin. 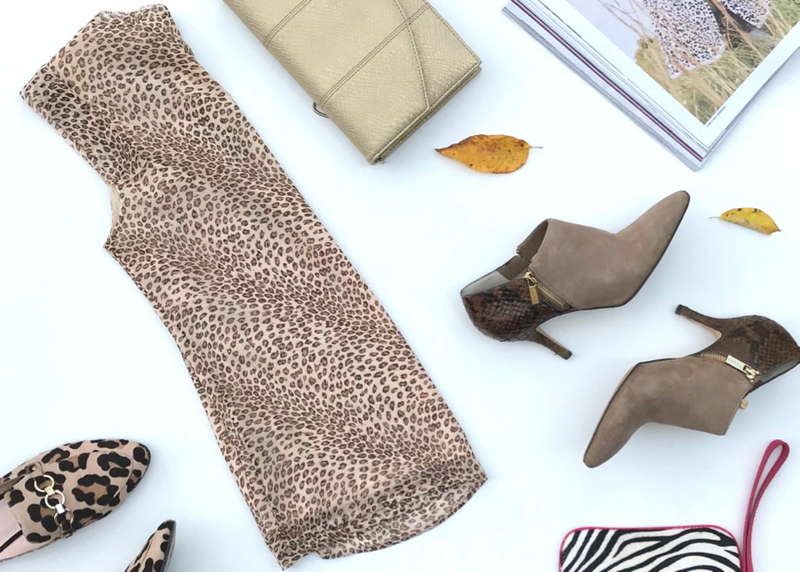 You’ll find leopard prints in coats, dresses, shoes, sweaters, and pants. The most interesting piece I have seen in stores is this Shrimps Martini clutch handbag with heart-shaped handles, perfect for the animal (print) lover! I’m also seeing a lot of zebra prints such as this J.Crew cardigan, this Zara shirt-dress and this handbag from Frances Valentine. If you like snakeskin, designers are adding touches of color such as a yellow stripe on this snakeskin print top or black and red stripes to this snakeskin clutch. 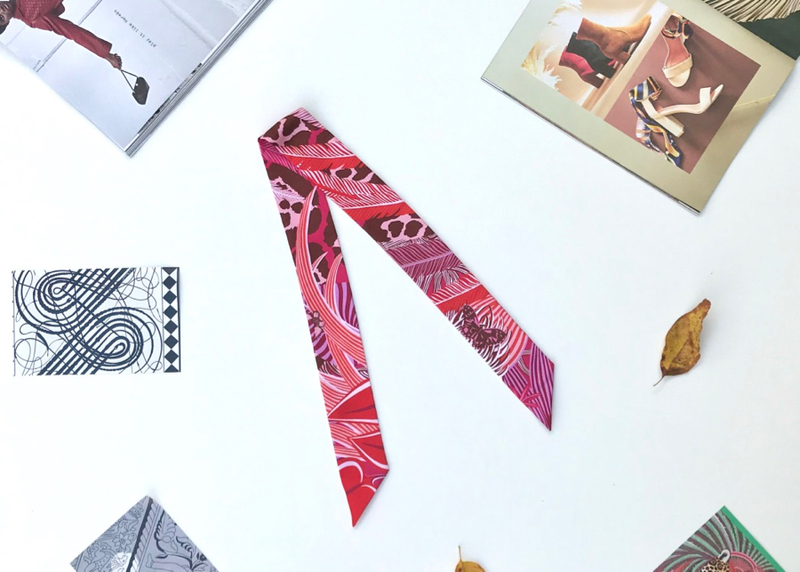 I wrote about scarf prints in this post and I’m mentioning them again today as they are an easy way to make a big impact. My favorite scarf shape is long and skinny. You can tie it in a simple knot around your neck or wrist, or on your handbag. If you want to be really fashion forward, Anthropologie has some stunning heels with silk scarf ties. Anthropologie also has a gorgeous scarf print dress in neutral colors. If you want something more subtle, try a camisole top and wear it with pants and a blazer. 70s style pants have a flared hem but are slim through the hips and thighs. The other wide-leg style is looser in the hips and thighs, and down to the hem. Early in the fall, wear wide-leg cropped pants. I mentioned Athleta’s Tribeca pants in my last post but if you’re looking for more options, try these J.Crew cotton poplin wide-leg pants with a tie-belt. Later in the fall, switch to full-length wide-leg pants like Athleta’s Chelsea Wide-leg pants or Chriselle Lim’s Lola wide-leg pant. For weekends, try wide-leg pajama-style pants. How can we be inspired by the 70s, 80s and the 90s too? That’s just how the fashion world rolls! What goes around comes back around, over and over. I’m seeing a lot of oversized blazers, high-waisted jeans, and solid t-shirts. If you’re feeling bold, try this Joie ruched sleeve blazer or this Sandro plaid blazer. For work, skip the jeans and try a double-breasted style. Remember the 90s “power suit”? Theory has a pretty serious power blazer for your important work days. For evenings try a metallic or a velvet blazer. What Didn’t Make My List Of Wearable Fall Fashion? We’ll leave those for the supermodels! What’s on your list for fall? See more of what’s available in-store and online, in my NEW Pinterest board Fall/Winter 2018/2019 Fall Style. Hi Susan! Do you have a favorite piece?